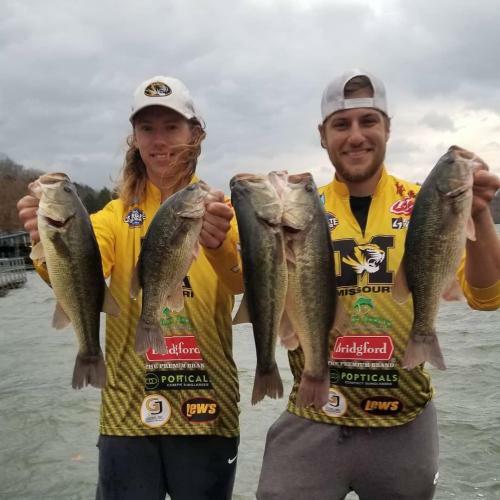 Our final club tournament for the Mizzou bass team was December 1st so Justin and I headed down to the lake on Thursday Nov 29. we fished almost all day and only had 6 keeper bites but they were good ones. 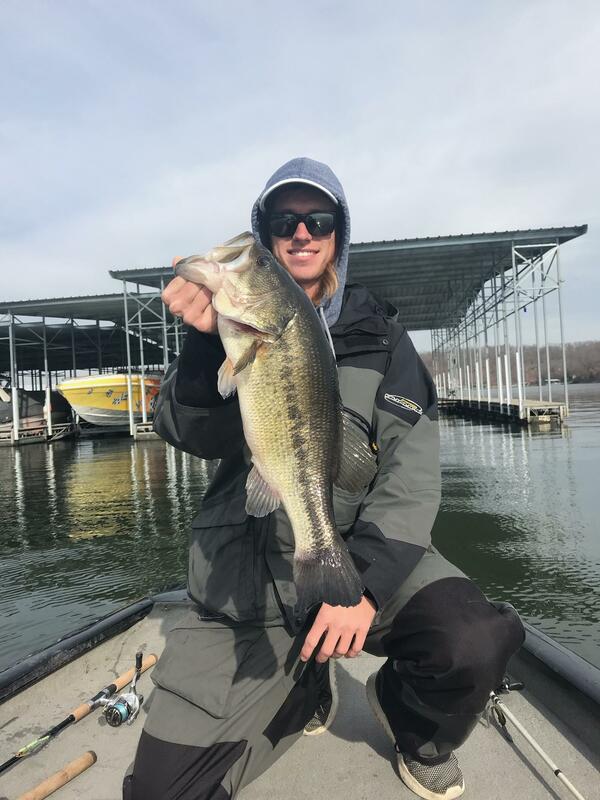 Cranked some shallow banks inside of main lake points with a square bill to catch my good one which was a 4.46 and actually came on a underspin and Justin's came off on an A-Rig in front of a condo dock and was 4.63. It seemed to be kind of one of those typical LOZ days where you catch a good one doing something and then try to run that pattern for the next 2 hours and get 1 or no bites. Thursday was a slower day but we had a good bag that went 14.02 pounds. Saturday was windy but warm. 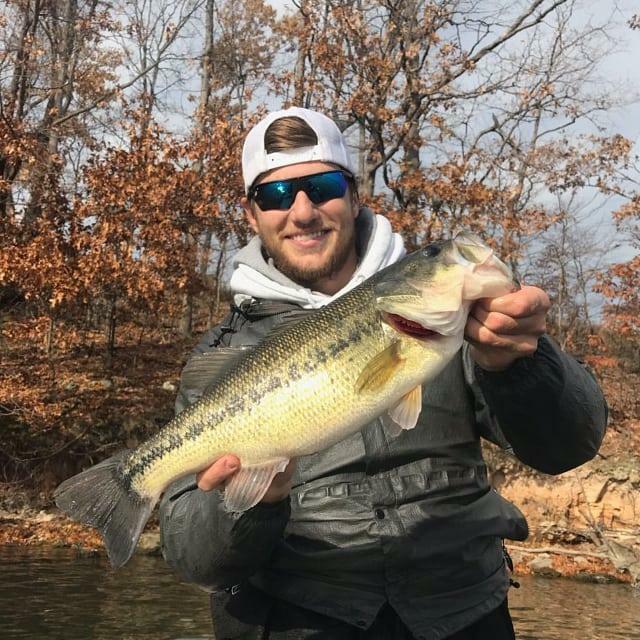 We fished shallow on points almost all day (0-10 foot) with an a-rig and square bill. The points with a littler steeper drop seemed to be better. We caught 20 keepers all together but 17 of them were spots. The things about the spots was that many of them were nicer ones over 15 inches and about 1.75 lbs. The 1.5 square bill seemed to be really key because the fish were feeding on smaller shad. Justin did not get nearly as many bites or better bites when he was throwing a 2.5 or a rock crawler. With about an hour left to fish we decided to try to catch a couple more largemouth because I had caught the only one, a 3.5 pounder off a break wall on an a-rig, so we fished a riprap secondary point and caught a short largemouth and lost a keeper largemouth at the boat. We ran with that idea until the end of the day and caught 2 more keeper largemouth and 2 short largemouth. The wind was pretty bad; especially in the 18.5 ft aluminum jet so it limited where we could fish a little but all in all it was a great day and we had a little over 13 ponds for our best 5. Another guy on the team caught them fairly decent fishing a spinner bait. 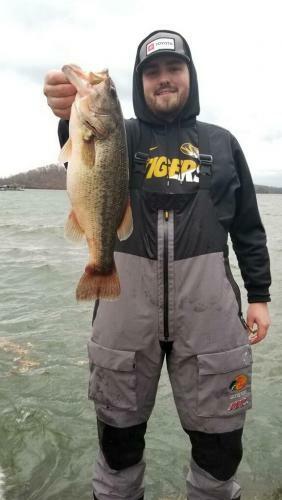 Also, thanks for the support to the Mizzou Team guys we are looking forward to fishing the tournaments in the spring. It will be here before you know it. Now back to studying for finals...Tight Lines! Wow you guys got to relocate some nice fish!